The top 12 hacking teams in the world convened on EC-Council Foundation’s Hacker Halted Conference to compete at the annual Global CyberLympics Championship. The Dutch team, Team Hack.ERS, continued their traditional of dominance, capturing the world title for the fifth time. A Global CyberLympics player works to decode the Codex. Throughout the day, teams were busy solving challenges on the game network that ranged in skill levels and disciplines. Some challenges were based on computer forensics, while others focused on pen testing, hacking, and problem solving. This year’s Cyberlympics started of with some new twists. The top two teams representing each region were surprised to find that when they reached their tables there was no network equipment to connect to the game server. Instead, each team found a Da Vinci Code Cryptex, a portable vault used to hide messages based on the popular Da Vinci Code movies and books. The players had to figure out the password of the vault in order to find USB drives that contained tools and challenges. Teams that unlocked their vaults also earned their switches and the ability to connect to the game network. 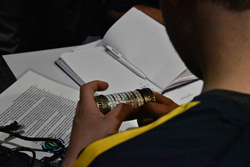 This exercise added intensity to the start of the games because teams were able to connect to the game network and begin challenges more quickly by working together to crack the Cryptex. Throughout the day, teams were busy solving challenges on the game network that ranged in skill levels and disciplines. Some challenges were based on computer forensics, while others focused on pen testing, hacking, and problem solving. The unifying theme of all the challenges was the requirement for team coordination. For example, the RFID challenge required gamers to leaving the gaming area, pick a lock on a cabinet to find clues, passwords, and an RFID device. None of the gamers knew that some of the game moderators had RFID tokens hanging from lanyards on their belt loops. Gamers that figured it out could use the RFID device to clone the ID of the moderator, which helped them open the challenge. There was also a "0 to root" challenge which provided teams five minutes to gain access to a previously unseen biometric reader. Only one team was able to gain root level access. As in the sports Olympics, the Global Cyberlympics competition is more than a “capture the flag” competition. While there were CTF-type challenges, there were many obstacles that challenged many more aspects of information security beyond a teams’ ability to capture and defend a machine in a static platform. Only well-rounded and truly skilled teams were able to complete all the challenges. First place Team HackERS walked away with $1000 in cash prizes, medals, and the World Champion CyberLympics Globe. Second place went to Jobless Hackers, also of the Netherlands. Third place was KLHT from Russia.